A tasty Mexican inspired treat! Yummy! To Temper Chocolate: The process of tempering chocolate is necessary to make it more malleable for dipping and coating, and to ensure it stays shiny and snappy once it has set. One of the best ways of doing this is a process called ‘seeding’, which involves melting two-thirds of the required amount of chocolate in a bain-marie, and then adding the remaining third to it. This encourages the cocoa butter crystals to return to their original state once they set. If, for some reason, the tempered chocolate doesn’t come out right, you can always repeat the process using the same chocolate, meaning that no chocolate is wasted. Firstly, lay the parchment paper over a flat and cold surface, in a cool area. Keep aside until required. Temper the chocolate as above and add the chilli flakes. With a dessertspoon, drop small spoonfuls of chocolate onto the parchment paper, using the back of the spoon to flatten and even the circles. Work 6 or 10 mendiants at a time, then decorating them, before making three new circles. 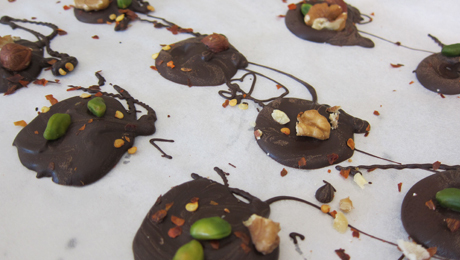 When a batch is complete, leave the parchment paper sheet to cool until the chocolate hardens. Wait until the chocolate is completely set before lifting the mendiants carefully from the sheet.